Guide to Ciudad Quesada, a town on the Costa Blanca, Spain. 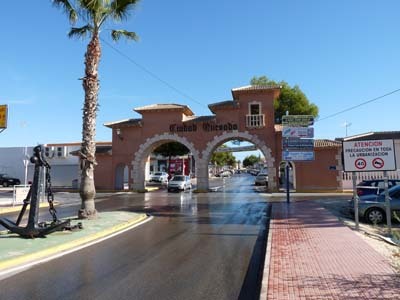 Ciudad Quesada - When you look at the history of most of the villages and towns of the Costa Blanca, you will find stories of ancient settlers, Roman innovation, Arab conquests and Christian “Conquistadors”. When you look at the history of Ciudad Quesada you will find nothing of the kind. In fact the history of Ciudad Quesada goes back only 30 years or so to 1972, when one man’s lifelong dream started to become a reality. Building one’s own city is perhaps not a common dream for a normal man, but Spanish entrepreneur Justo Quesada Samper could not be classed as a normal man - and this was his dream - to create his own self contained city where people could prosper and enjoy life. His dream grew from those early days until 1999 when the award winning Ciudad Quesada was finally given its own Town Hall. Ciudad Quesada stands today as a monument to what one man can achieve through patience and perseverance, and a fine monument it is. Rising up from the surrounding countryside, the white houses of Quesada can be seen from many miles away. Up on one of the highest parts of the town stands the Aqua Park with its many slides and swimming pools, from the top of the highest slide there is a stunning view of the entire region - the higher mountains in the background, the neighbouring towns and villages, the salt lakes and natural park of La Mata and Torrevieja and the blue Mediterranean shimmering in the distance - breathtaking! From the CV90 close to junction 745 of the AP-7 motorway you can enter Ciudad Quesada via an impressive arched gateway. The main shops, bars and restaurants are just inside this archway and this is the main meeting point for the residents of the town and holidaymakers alike. Other facilities that can be found in Ciudad Quesada are a Medical Centre, a Social Club and the La Marquesa 18 hole golf course designed by Justo Quesada Samper himself. Though Ciudad Quesada itself is very new and modern, neighbouring Rojales is very old and well worth a visit if you are in the area. The cave houses of Rojales are particularly interesting, carved into the side of a hill in the 19th Century, and now a haven for local artists and craftsmen to display their wares to visitors. Also worth a visit is the impressive Shell House, the result of many years work by another man with a dream and a great deal of patience (but that is another story!). Visitors may also wish to take a trip to the Parque Natural de La Mata y Torrevieja with its salt flats and varied wildlife, it’s marked out walking and cycling routes and its shaded picnic area. There is a small Tourist Information office on the N332 at La Mata where details of the park can be found and information about the marked out trails. Ciudad Quesada can be reached from Rojales or more easily via the previously mentioned CV90 from Torrevieja or the AP-7 motorway, junction 745.